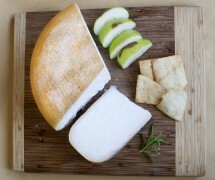 Finger Lakes Gold is a hard cheese made from pasteurized goat’s milk. Aged for at least three months, it is characterized by a beautiful yellow-gold rind and a white, firm but creamy paste. Finger Lakes Gold is both milky and nutty, a mellow cheese that is perfectly at home on a cheeseboard as well as in the kitchen.